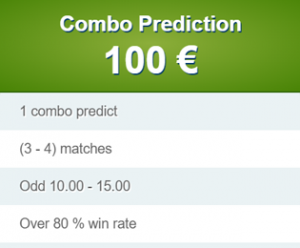 The Combined bets category in Football-Predict gives you the opportunity to win from bets with odds 10.00 – 15.00.. The matches you’ll be offered will be 3 to 4 and each one can have a different type of betting (1×2,Over/Under,Double Chance,Half Time/Full Time etc). Football-predict.com is a system for predicting football matches on the basis of statistics.The site offers football predictions for each round of the worl`s leading leagues generated by mathematical algorithms. The site has a huge database with the football data of mora than 150 leagues for the past 17 years.